factory standards with genuine Nikon parts. until it’s safely back in your hands. Old or New we can repair your video equipment. Most often people experience body damage, or transport issues, LCD replacement, No power, tape errors. Recently, I dropped in at Camera Services in Atlanta to see if they could repair my Nissan flash. I was delighted that they took the time right then to have a tech look at my flash. It only took a few minutes and when the young lady in the office brought my flash back, she said, “you’re ready to go.” The problem had been minor and they fixed it on the spot. When I asked how much I owed them, she said, “nothing-have a great day!” From the 1st phone call to the last goodbye, they were pleasant and professional. I will go back if and when I have a problem with my equipment. Thanks again, Camera Service! 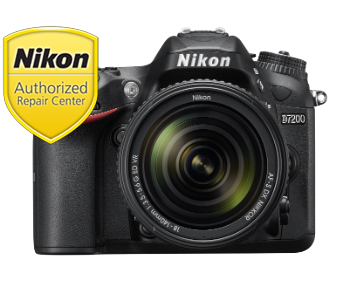 I needed the shutter replaced in my Nikon D750 and after looking for days for someone who could do it, my husband was recommended to this place. We live several states away so mailing my camera off to them was nerve wracking to say the least, but I would do it again! They let us know when they got it, and soon after what needed to be done and what it would cost. After they got the shutter they had it fixed quickly and overnighted back to me in time for my next gig. I’m so thankful and will use them in the future if something happens to one of my cameras again! Definitely recommend. First of all, I have to say that the customer service here is well beyond anything I’ve gotten anywhere else! I dropped my camera off for a simple repair, but it ended up being sent Nikon because it was a manufacturer issue. When I called to check on the return time I was informed that it would take longer than they anticipated. I was a bit upset and a little panicked because I was being deployed and really wanted to have a camera for the Tiger Cruise beforehand. When I told the manager this, he immediately told me not to worry and that he would take care of me. He couldn’t get the camera back from Nikon any sooner, so he sent me a loaner to use in the mean time! No corporate business that I know of would have done that! Not only did he go above and beyond what most people would, he took it into his own hands and solved the problem on the spot! This is exactly what makes small businesses in this country great! I’m not a professional photographer or anything, but from now on, any time I or any of my family or friends need camera service, this is the place I’ll call first! A HUGE thanks to Camera Service Co for everything!! I’ve done business with Atlanta Camera repair for years, I’v had my cameras and lens repaired. My equipment was repaired right and timely. The owner gave me a tour of is repair area in the back Wonderful customer service. I suggest them to all of my photography friends. I will always used them. They are not cheap however they do excellent work.Thank you for being there. I contacted Camera Service Company after speaking with another authorized Canon repair company who told me my wife’s Power Shot G7 camera could not be repaired. They told me the parts were not available and suggested I buy a G9 they had which was reconditioned. I spoke with Allison at C.S.R. I explained the problem and she told me that she thought they could repair the camera. Allison called me after they received the camera on 1/13 and told me the cost to repair it including shipping! Allison told me it would be between 5 and 7 days to repair the camera. We received our repaired camera on 1/18. I will not use another camera repair company for any future repairs. Allison is an excellent representative for this company. What a pleasure to have a company like this to go to in this day and age. The service was simply OUTSTANDING. And the price was very reasonable. Camera Service fixed my film camera (a Minolta Maxxum 7, made by a company that has been out of business for years) in a few days and gave me three months of guarantee. The quote that I had previously gotten from another place was much more. Reasonable price and perfect job. So happy I found them. This will always be my place if I’ll need to repair any of my cameras. Long live Camera Service Co.
Best camera repair shop in Atlanta. Quick assessment of your needs, consistently good repair work. Will give you fair estimated quote and price . Quick turnaround times. I brought in a pair of older Canon G10s which had been repaired (poorly) at another facility and then died. They were able to bring both back to life and I was quite pleased with the price and service. I also managed to crack the glass covering the LCD screen on my 6D and they provided a very reasonable quote. It was fixed quickly and looks great. Very knowledgeable and professional. Bottom line, I have used them several times and will use them again. It’s about an hour drive each way for me to get to them, but it is worth it. They stand by their promises, even if it doesn’t work the first time.